Garden tools means we are talking about the tools which help us in gardening as- Acorn,Bark,Grove etc. We know almost all gardening name in English. As you are learning Spanish so you have to know all garden tools name in Spanish. Gardening is hobby of many person. The person who loves flowers and plants, make a small garden out side if his home. So today we are talking about garden tools in Spanish. It is very important to know all types words in Spanish. We have posted many lists related to vocabulary in Spanish for making your vocabulary strong as- List of weather vocabulary in Spanish, List of flowers name in Spanish, List of fruits name in Spanish, List of masculine and feminine nouns in Spanish, List of schools objects in Spanish, List of chores in Spanish, List of Shopping words in Spanish And many others. So you can learn all vocabulary. 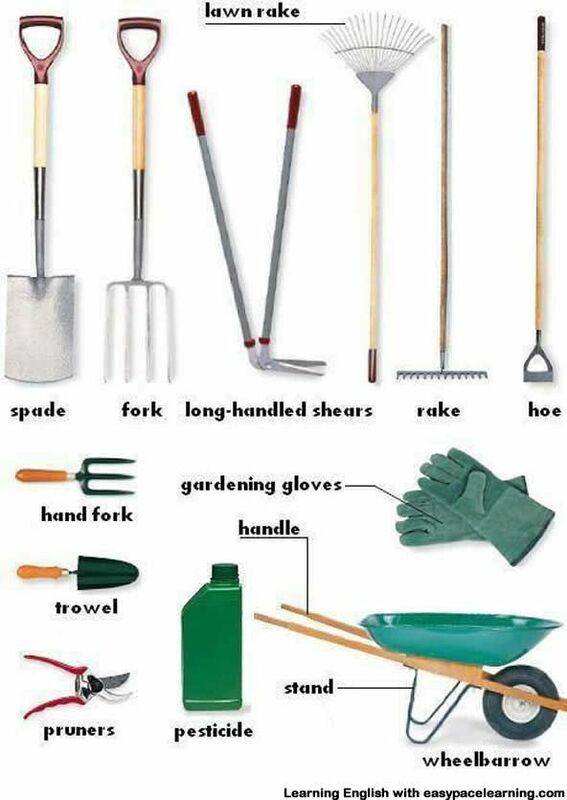 We have given below list of garden tools in Spanish. You can read and learn it. So this is the list of gardening tool’s name in Spanish. I have given A to Z Garden tools name in Spanish. It is very easy to learn Spanish. The only things you have to do that concentrate on this only on learning and learn vocabulary as much as you can. Because It is very important to learn words for making sentences in Spanish. Please comment in comment box about this posts. Thank you. This entry was posted in Basic Spanish for Beginners, Vocabulary of Spanish language and tagged A to z vocabulary of garden in Spanish, All gardening tools name in Spanish, Garden tools in Spanish, Hoe in Spanish, Hose in Spanish, How do you say Hoe in Spanish, How do you say Hose in Spanish, How do you say Rake in Spanish, How do you say Trowel in Spanish, How do you say Watering can in Spanish, How to say Hoe in Spanish, How to say Hose in Spanish, How to say Rake in Spanish, How to say Trowel in Spanish, How to say Watering can in Spanish, List of garden tools name in Spanish, Rake in Spanish, Trowel in Spanish, Watering can in Spanish on February 7, 2017 by satyenhacks. 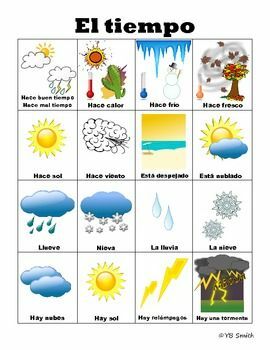 Weather expressions means we are here with weather vocabulary in Spanish. In this post, you will know that how to say “it is hot” and many other weather phrases in Spanish. So you can easily speak Spanish related to weather expressions after reading this article. It is very easy to learn any language the only one thing you have to know that you have to learn vocabulary as much as you can. If your vocabulary is strong in any language then you can learn that language easily. So today we are going to discuss about weather vocabulary. We have posted many article of vocabulary lists in Spanish by which you can learn all types of vocabulary in Spanish as- List of shapes in Spanish, How to say shoes type in Spanish, List of zodiac sign in Spanish, List of Objects in Spanish, List of flowers name in Spanish, list of fruits name in Spanish, List of utensils in Spanish and many other Spanish vocabulary’s lists. So you can read all vocubulary for making your Spanish vocabulary strong. We have given list of weather Expressions in Spanish. Read and learn it from the given list. This entry was posted in Basic Spanish for Beginners, Vocabulary of Spanish language and tagged A to z wether vocabulary in Spanish, Bad weather in Spanish, Dew in Spanish, Drizzle in Spanish, Flood in Spanish, Frost in Spanish, Good weather in Spanish, Hail in Spanish, Heavy rain in Spanish, How do you say Bad weather in Spanish, How do you say Dew in Spanish, How do you say Drizzle in Spanish, How do you say Flood in Spanish, How do you say Frost in Spanish, How do you say Good weather in Spanish, How do you say Hail in Spanish, How do you say Heavy rain in Spanish, How do you say Hurricane in Spanish, how do you say It is cloudy in Spanish, How do you say It is cold in Spanish, How do you say It is cool in Spanish, How do you say It is foggy in Spanish, How do you say It is hot in Spanish, How do you say It is humid in Spanish, How do you say It is raining in Spanish, How do you say It is snowing in Spanish, How do you say It is sunny in Spanish, How do you say It is very windy in Spanish, How do you say It is warm in Spanish, How do you say It is windy in Spanish, How do you say Light rain in Spanish, How do you say Lightning flash in Spanish, How do you say Rain in Spanish, How do you say Raining cats and dogs in Spanish, How do you say Rainstorm in Spanish, How do you say Ray of lightning in Spanish, How do you say Snow in Spanish, How do you say Storm in Spanish, How do you say Temperature in Spanish, How do you say The sky is clear in Spanish, How do you say There is a breeze in Spanish, How do you say Thunder in Spanish, How do you say Tornado in Spanish, How do you say Wind in Spanish, How to say Bad weather in Spanish, How to say Dew in Spanish, How to say Drizzle in Spanish, How to say Flood in Spanish, How to say Frost in Spanish, How to say Good weather in Spanish, How to say Hail in Spanish, How to say Heavy rain in Spanish, How to say Hurricane in Spanish, How to say It is cloudy in Spanish, How to say It is cold in Spanish, How to say It is cool in Spanish, How to say It is foggy in Spanish, How to say It is hot in Spanish, How to say It is humid in Spanish, How to say It is raining in Spanish, How to say It is snowing in Spanish, How to say It is sunny in Spanish, How to say It is very windy in Spanish, How to say It is warm in Spanish, How to say It is windy in Spanish, How to say Light rain in Spanish, How to say Lightning flash in Spanish, How to say Rain in Spanish, How to say Raining cats and dogs in Spanish, How to say Rainstorm in Spanish, How to say Ray of lightning in Spanish, How to say Snow in Spanish, How to say Storm in Spanish, How to say Temperature in Spanish, How to say The sky is clear in Spanish, How to say Thunder in Spanish, How to say Tornado in Spanish, How to say Wind in Spanish, Hurricane in Spanish, It is cloudy in Spanish, It is cold in Spanish, It is cool in Spanish, It is foggy in Spanish, It is hot in Spanish, It is humid in Spanish, It is raining in Spanish, It is snowing in Spanish, It is sunny in Spanish, It is very windy in Spanish, It is warm in Spanish, It is windy in Spanish, Light rain in Spanish, Lightning flash in Spanish, List of weather expressions in Spanish, Rain in Spanish, Raining cats and dogs in Spanish, Rainstorm in Spanish, Ray of lightning in Spanish, Snow in Spanish, Storm in Spanish, Temperature in Spanish, The sky is clear in Spanish, There is a breeze in Spanish, Thunder in Spanish, Tornado in Spanish, weather vocabulary in Spanish, Wind in Spanish on February 7, 2017 by satyenhacks. Dessert means what we take after eating as- Ice-cream,cake and many other things. So we know many desserts in English but we are learning Spanish then it is important to know everything in Spanish. We have posted many posts related to English Spanish vocabulary for increasing your vocabulary of Spanish language As- List of Junk food in Spanish, List of diseases in Spanish, List of Zoo animals in Spanish, List of jewelry in Spanish,list of direction in Spanish and many other. You can read all by clicking on the link. This is another post for increasing your vocabulary of Spanish language. We have given list of desserts in Spanish below. You can learn from the given list. It is very important vocabulary which need in our daily life as- cake, ice-cream, candy and many other. So if you are learning Spanish then go below and learn all dessert name in Spanish. So this the list of desserts in Spanish means another vocabulary section for Spanish learning students who want to learn Spanish. I have almost all types of desserts name in Spanish. So you can learn all desserts name in Spanish. If you want to learn easily then you have to merge all vocabulary in your language means you have to mix Spanish vocabulary in English language. By using this trick you can learn all desserts name in Spanish. Please comment your experience in learning Spanish in the given comment box.Thanks. This entry was posted in Basic Spanish for Beginners, Vocabulary of Spanish language and tagged A to Z desserts name in Spanish, All desserts name in Spanish, Almond biscuits in Spanish, Almond rings in Spanish, Apple pie in Spanish, Assorted biscuits in Spanish, Bavarian cream in Spanish, Biscuits in Spanish, Blancmange in Spanish, Bombe in Spanish, Brioche in Spanish, Cake in Spanish, Candy in Spanish, Carrot cake in Spanish, Cheesecake in Spanish, Cherry biscuits in Spanish, Chocolate bar in Spanish, Chocolate bavarian cream in Spanish, Chocolate bites in Spanish, Chocolate bonbon in Spanish, Chocolate cake in Spanish, Chocolate chip cookie in Spanish, Chocolate chips in Spanish, Chocolate cookie in Spanish, Chocolate fudge in Spanish, Chocolate ice-cream in Spanish, Chocolate in Spanish, Chocolate milk in Spanish, Chocolate mousse in Spanish, Chocolate sauce in Spanish, Chocolate-fingers in Spanish, Christmas biscuits in Spanish, Cocoa powder in Spanish, Coconut cookie in Spanish, Cookies in Spanish, Cream-filled brioche in Spanish, Crepe in Spanish, Crunchy biscuits in Spanish, Custard in Spanish, Custard profiteroles in Spanish, Dark chocolate in Spanish, Desserts in Spanish, Desserts name, Desserts Spanish menu, Desserts Spanish translation English to Spanish, Donuts in Spanish, Doughnut with custard filling in Spanish, Dry biscuits in Spanish, Egg-nog profiteroles in Spanish, Fritters in Spanish, Fruit salad in Spanish, Hot chocolate in Spanish, How do you say Almond biscuits in Spanish, How do you say Almond rings in Spanish, How do you say Apple pie in Spanish, How do you say Assorted biscuits in Spanish, How do you say Bavarian cream in Spanish, How do you say Biscuits in Spanish, how do you say Blancmange in Spanish, How do you say Bombe in Spanish, How do you say Brioche in Spanish, How do you say Cake in Spanish, How do you say Candy in Spanish, How do you say Carrot cake in Spanish, How do You say Cheesecake in Spanish, How do you say Cherry biscuits in Spanish, How do you say Chocolate bar in Spanish, How do you say Chocolate bavarian cream in Spanish, How do you say Chocolate bites in Spanish, How do you say Chocolate bonbon in Spanish, How do you say Chocolate cake in Spanish, How do you say Chocolate chip cookie in Spanish, How do you say Chocolate chips in Spanish, How do you say Chocolate cookie in Spanish, How do you say Chocolate fudge in Spanish, How do you say Chocolate ice-cream in Spanish, How do you say Chocolate in Spanish, How do you say Chocolate milk in Spanish, How do you say Chocolate mousse in Spanish, How do you say Chocolate sauce in Spanish, How do you say Chocolate-fingers in Spanish, How do you say Christmas biscuits in Spanish, How do you say Cocoa powder in Spanish, How do you say Coconut cookie in Spanish, How do you say Cookies in Spanish, How do you say Cream-filled brioche in Spanish, How do you say Crepe in Spanish, How do you say Crunchy biscuits in Spanish, How do you say Custard in Spanish, How do you say Dark chocolate in Spanish, How do you say Desserts in Spanish, How do you say Donuts in Spanish, How do you say Doughnut with custard filling in Spanish, How do you say Dry biscuits in Spanish, How do you say Egg-nog profiteroles in Spanish, How do you say Fritters in Spanish, How do you say Fruit salad in Spanish, How do you say Hot chocolate in Spanish, How do You say Ice cream in Spanish, How do you say Iced biscuit in Spanish, How do you say Jam-filled brioche in Spanish, How do you say Jello in Spanish, How do you say Lady’s kisses (almond pastries) in Spanish, How do you say Lemon cake in Spanish, How do you say Macaroons (almond biscuits – usa: cookies) in Spanish, How do you say Meringue in Spanish, How do you say Milk chocolate in Spanish, How do you say Muffins in Spanish, How do you say Nougat-mousse profiteroles in Spanish, How do you say Organic-flour biscuits in Spanish, How do you say Pie in Spanish, How do you say Profiteroles in Spanish, How do you say Pudding in Spanish, How do you say Pumpkin pie in Spanish, How do you say Rice pudding in Spanish, How do you say Rum baba (small leavened cake shaped like a mushroom) in Spanish, How do you say Savoiardi in Spanish, How do you say Semisweet chocolate in Spanish, How do you say Short-pastry biscuits in Spanish, How do you say Strawberries in aspic in Spanish, How do you say Sugar-free chocolate in Spanish, How do you say Swiss roll in Spanish, How do you say Tarts in Spanish, How do you say Tea biscuits in Spanish, How do you say Unsweetened chocolate in Spanish, How do you say Vanilla bavarian cream in Spanish, How do you say White chocolate in Spanish, How do you say Wholemeal biscuits in Spanish, How to say Almond biscuits in Spanish, How to say Almond rings in Spanish, How to say Apple pie in Spanish, How to say Assorted biscuits in Spanish, How to say Bavarian cream in Spanish, How to say Biscuits in Spanish, How to say Blancmange in Spanish, How to say Bombe in Spanish, How to say Brioche in Spanish, How to say Cake in Spanish, How to say Candy in Spanish, How to say Carrot cake in Spanish, How to say Cheesecake in Spanish, How to say Cherry biscuits in Spanish, How to say Chocolate bar in Spanish, How to say Chocolate bavarian cream in Spanish, How to say Chocolate bites in Spanish, How to say Chocolate bonbon in Spanish, How to say Chocolate cake in Spanish, How to say Chocolate chip cookie in Spanish, How to say Chocolate chips in Spanish, How to say Chocolate cookie in Spanish, How to say Chocolate fudge in Spanish, How to say Chocolate ice-cream in Spanish, How to say Chocolate in Spanish, How to say Chocolate milk in Spanish, How to say Chocolate mousse in Spanish, How to say Chocolate sauce in Spanish, How to say Chocolate-fingers in Spanish, How to say Christmas biscuits in Spanish, How to say Cocoa powder in Spanish, How to say Coconut cookie in Spanish, How to say Cookies in Spanish, How to say Cream-filled brioche in Spanish, How to say Crepe in Spanish, How to say Crunchy biscuits in Spanish, How to say Custard in Spanish, How to say Custard profiteroles in Spanish, How to say Dark chocolate in Spanish, How to say Desserts in Spanish, How to say Donuts in Spanish, How to say Doughnut with custard filling in Spanish, How to say Dry biscuits in Spanish, How to say Egg-nog profiteroles in Spanish, How to say Fritters in Spanish, How to say Fruit salad in Spanish, How to say Hot chocolate in Spanish, How to say Ice cream in Spanish, How to say Iced biscuit in Spanish, How to say Jam-filled brioche in Spanish, How to say Jello in Spanish, How to say Lady’s kisses (almond pastries) in Spanish, How to say Lemon cake in Spanish, How to say Macaroons (almond biscuits – usa: cookies) in Spanish, How to say Meringue in Spanish, How to say Milk chocolate in Spanish, How to say Muffins in Spanish, How to say Nougat-mousse profiteroles in Spanish, How to say Organic-flour biscuits in Spanish, How to say Oval tartlets with fruit in Spanish, How to say Pie in Spanish, How to say Profiteroles in Spanish, How to say Pudding in Spanish, How to say Pumpkin pie in Spanish, How to say Rice pudding in Spanish, How to say Rum baba (small leavened cake shaped like a mushroom) in Spanish, How to say Savoiardi in Spanish, How to say Semisweet chocolate in Spanish, How to say Short-pastry biscuits in Spanish, How to say Strawberries in aspic in Spanish, How to say Stuffed oranges in Spanish, How to say Sugar-free chocolate in Spanish, How to say Swiss roll in Spanish, How to say Tea biscuits in Spanish, How to say Unsweetened chocolate in Spanish, How to say Vanilla bavarian cream in Spanish, How to say White chocolate in Spanish, How to say Wholemeal biscuits in Spanish, Howdo you say Oval tartlets with fruit in Spanish, Ice cream in Spanish, Iced biscuit in Spanish, Jam-filled brioche in Spanish, Jello in Spanish, Lady’s kisses (almond pastries) in Spanish, Lemon cake in Spanish, List of desserts name in Spanish, Macaroons (almond biscuits – usa: cookies) in Spanish, Meringue in Spanish, Milk chocolate in Spanish, Muffins in Spanish, Nougat-mousse profiteroles in Spanish, Organic-flour biscuits in Spanish, Oval tartlets with fruit in Spanish, Pie in Spanish, Profiteroles in Spanish, Pudding in Spanish, Pumpkin pie in Spanish, Rice pudding in Spanish, Rum baba (small leavened cake shaped like a mushroom) in Spanish, Savoiardi in Spanish, Semisweet chocolate in Spanish, Short-pastry biscuits in Spanish, Spanish, Strawberries in aspic in Spanish, Stuffed oranges in Spanish, Sugar-free chocolate in Spanish, Swiss roll in Spanish, Tarts in Spanish, Tea biscuits in Spanish, Unsweetened chocolate in Spanish, Vanilla bavarian cream in Spanish, White chocolate in Spanish, Wholemeal biscuits in Spanish on January 31, 2017 by satyenhacks. As you are learning Spanish then you have to know about directions and many other vocabulary in Spanish because if you did not know about words in Spanish then you can not know any things in Spanish because vocabulary is basic requirement for learning any language. We have posted many vocabulary article for making your Spanish vocabulary strong as- List of Diseases in Spanish, List of utensils in Spanish, List of countries name in Spanish, list of flowers name in Spanish, List of fruits name in Spanish and many list of vocabulary section. So you cab read these article by clicking on the link. So today we are discussing about all direction name in Spanish. It is very important to know about all direction in Spanish because if you want to ask or tell any way in Spanish then you have to know it in Spanish and also you can discuss with your friend. I have given list of directions in Spanish. So read all direction and learn it. Excuse me. Where’s the bank? Perdón. ¿Dónde está el banco? I’m looking for the tourist office. Estoy buscando la oficina de turismo. Is it far? ¿Está lejos? I am lost. / I have lost my way. Me he perdido. Could tell me the way to the bank? ¿Me podría decir por dónde se va al banco? Can you show me on the map? ¿Me lo puede mostrar en el plano/mapa? Is there a restaurant near here? ¿Hay un restaurante cerca de aquí? Is this the right way to the centre? ¿Voy bien por aquí para el centro? How do I get to Anne’s house? ¿Por dónde se va a la casa de Ana? Is the bank far? ¿El banco queda lejos? Go straight on Siga todo recto. Turn left/right out of Calle Mayor. Gire/Doble a la izquierda al salir de la Calle Mayor. Turn the corner. Doble la esquina. Turn around. Dé la vuelta. Cross the road Cruce la calle. It’s on the left Está a la izquierda. The school is on the left-hand side. El colegio está a mano izquierda. It’s on the other side of the street Está en la acera de enfrente. It’s at the end of the road. Está al final de la calle. It’s 100 metres away. Está a 100 metros de aquí. Take the next left. Coja la próxima a la izquierda. Take the second road Coja la segunda a la derecha. Which road do I take for Valencia? ¿Cuál es la carretera de Valencia? Follow the signs for Madrid. Siga las señales de Madrid. Does this bus go to the centre? ¿Va al centro este autobús? Is this the right stop for the museum? ¿Es esta la parada del museo? Where do I get the bus for Madrid / the cathedral? ¿Dónde cojo el autobús para Madrid / la Catedral? Can you get there by train? ¿Se puede ir en tren? 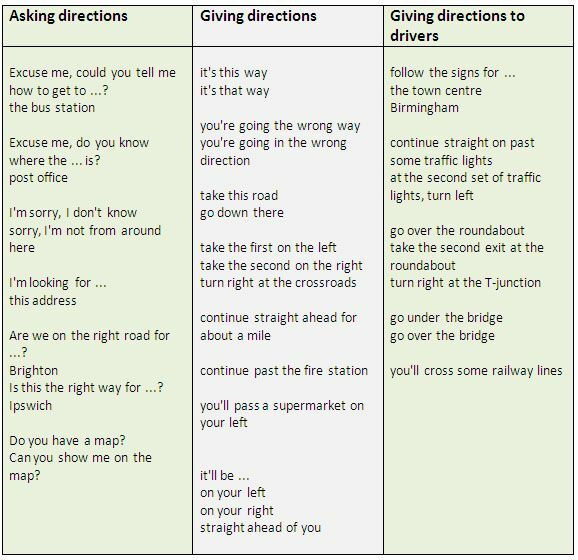 So this the list of direction in Spanish and I have mention some sentences related to directions in Spanish so you can learn and also make sentence by the of of given list. If you feel any problem in this article please mention in the comment box. We will try our best to solve. It is our pleasure to help you. Thanks. This entry was posted in Basic Spanish for Beginners, Vocabulary of Spanish language and tagged A road map in Spanish, A street map in Spanish, Alley in Spanish, Can you show me on the map? in Spanish, Could tell me the way to the bank? in Spanish, Cross the road in Spanish, Crossroads in Spanish, divided highway in Spanish, Down in Spanish, Dual carriageway in Spanish, East in Spanish, Excuse me. Where's the bank? in Spanish, Exit in Spanish, Far in Spanish, Go straight on in Spanish, Highway in Spanish, How do I get to Anne's house? in Spanish, How do you ask Can you show me on the map? in Spanish, How do you ask Excuse me. Where's the bank? in Spanish, How do you ask How do I get to Anne's house? in Spanish, How do you ask Is it far? in Spanish, How do you ask Is the bank far? in Spanish, How do you ask Is there a restaurant near here? in Spanish, How do you ask Is this the right way to the centre? in Spanish, How do you say A road map in Spanish, How do you say A street map in Spanish, How do you say Alley in Spanish, How do you say Could tell me the way to the bank? in Spanish, How do you say Cross the road in Spanish, How do you say Crossroads in Spanish, how do you say Down in Spanish, How do you say East in Spanish, How do you say Exit in Spanish, How do you say Far in Spanish, How do you say Go straight on in Spanish, How do you say highway in Spanish, How do you say I am lost in Spanish, How do you say I have lost my way in Spanish, How do you say I'm looking for the tourist office. in Spanish, How do you say It's on the left in Spanish, How do you say It's on the other side of the street in Spanish, How do you say Lane in Spanish, How do you say Left in Spanish, How do you say Left-hand lane in Spanish, How do you say Motorway in Spanish, How do you say Near in Spanish, How do you say Next to in Spanish, How do you say North in Spanish, How do you say Pavement / sidewalk in Spanish, How do you say Right in Spanish, How do you say Side street in Spanish, How do you say South in Spanish, How do you say Straight ahead in Spanish, How do you say Street/road in Spanish, How do you say The school is on the left-hand side in Spanish, How do you say To change lanes in Spanish, How do you say Traffic lights in Spanish, How do you say Turn around in Spanish, How do you say Turn left in Spanish, How do you say turn right in Spanish, How do you say Turn the corner in Spanish, How do you say Up in Spanish, How do you say West in Spanish, How to ask Can you show me on the map? in Spanish, How to ask Excuse me. Where's the bank? in Spanish, How to ask How do I get to Anne's house? in Spanish, How to ask Is it far? in Spanish, How to ask Is the bank far? in Spanish, How to ask Is there a restaurant near here? in Spanish, How to s ask Is this the right way to the centre? in Spanish, How to say A road map in Spanish, How to say A street map in Spanish, How to say Alley in Spanish, How to say Could tell me the way to the bank? in Spanish, How to say Cross the road in Spanish, How to say Crossroads in Spanish, How to say divided highway in Spanish, How to say Down in Spanish, How to say Dual carriageway in Spanish, How to say East in Spanish, How to say Excuse me. Where's the bank? in Spanish, How to say Exit in Spanish, How to say Far in Spanish, How to say Go straight on in Spanish, How to say highway in Spanish, How to say I am lost in Spanish, How to say I have lost my way in Spanish, How to say I'm looking for the tourist office. in Spanish, How to say Is it far? in Spanish, How to say It's at the end of the road in Spanish, How to say It's on the left in Spanish, How to say It's on the other side of the street in Spanish, How to say Lane in Spanish, How to say Left in Spanish, How to say Left-hand lane in Spanish, How to say Motorway in Spanish, How to say Near in Spanish, How to say Next to in Spanish, How to say North in Spanish, How to say Pavement / sidewalk in Spanish, How to say Right in Spanish, How to say Side street in Spanish, How to say South in Spanish, How to say Straight ahead in Spanish, How to say Street/road in Spanish, How to say The school is on the left-hand side in Spanish, How to say To change lanes in Spanish, How to say Traffic lights in Spanish, How to say Turn around in Spanish, How to say Turn left in Spanish, How to say turn right in Spanish, How to say Turn the corner in Spanish, How to say Up in Spanish, How to say West in Spanish, I am lost in Spanish, I have lost my way in Spanish, I'm looking for the tourist office in Spanish, Is it far? in Spanish, Is the bank far? in Spanish, Is there a restaurant near here? in Spanish, Is this the right way to the centre? in Spanish, It's at the end of the road in Spanish, It's on the left in Spanish, It's on the other side of the street in Spanish, Lane in Spanish, Left in Spanish, Left-hand lane in Spanish, Motorway in Spanish, Near in Spanish, Next to in Spanish, North in Spanish, Pavement / sidewalk in Spanish, Right in Spanish, Side street in Spanish, South in Spanish, Straight ahead in Spanish, Street/road in Spanish, The school is on the left-hand side in Spanish, To change lanes in Spanish, Traffic lights in Spanish, Turn around in Spanish, Turn left in Spanish, Turn right in Spanish, Turn the corner in Spanish, Up in Spanish, West in Spanish on January 30, 2017 by satyenhacks. Learning any language is very easy, If you are following few steps as- learning vocabulary, daily practice and concentrate your mind on learning on that language. 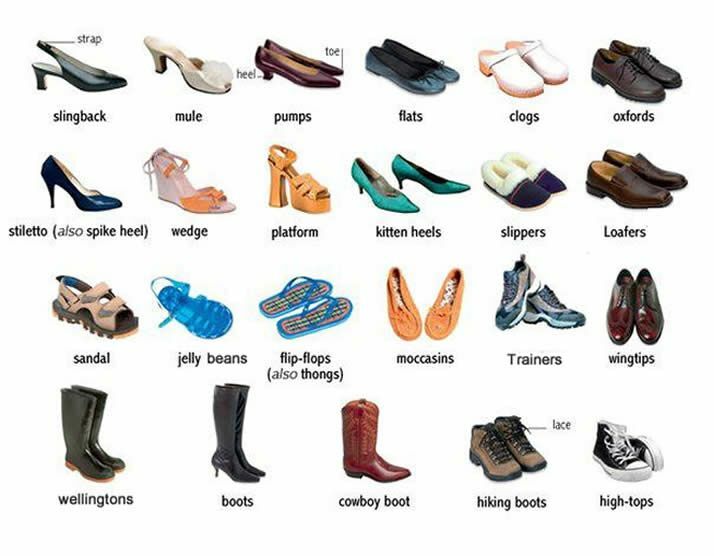 Among these steps, vocabulary one is very important because if you do not learn words then you can not make sentences. So you can not learn any language without learning vocabulary section. As you are learning Spanish then you have to learn vocabulary in Spanish. Do not worry about vocabulary section because we are here to help you. For preparation of vocabulary section, we have posted many posts related to vocabulary section as- List of time telling in Spanish, List of fruits name in Spanish, List of dog commands in Spanish, list of dog breeds in Spanish, List of flowers name in Spanish and many other. So you can find all vocabulary list easily on this website. Today we are talking about list of diseases in Spanish. 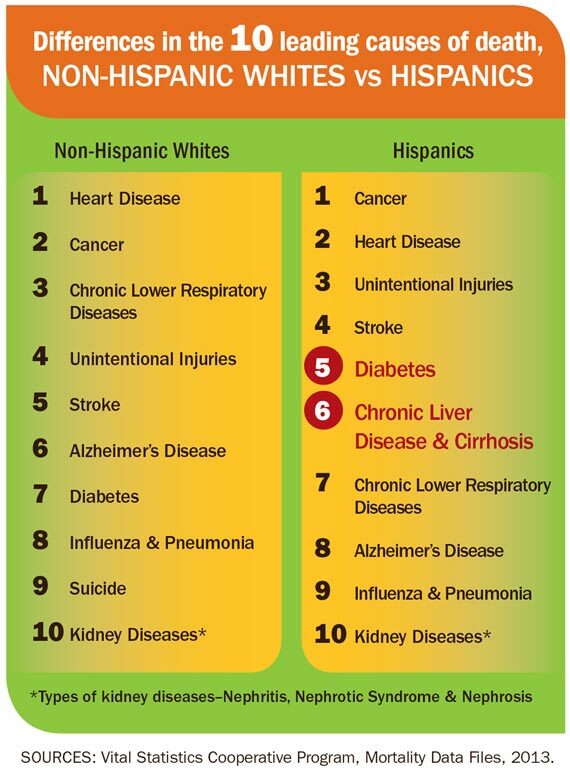 I have given list related to diseases in Spanish. You can learn from that list almost every words related to diseases, So all that name and learn and try to speak when you practice. So this is the list of diseases in Spanish. Almost all types of diseases are given in the list. We have also posted some vocabulary list related to vocabulary. So you can learn that so. It is very must to learn vocabulary in Spanish because it will help you to make sentences in Spanish. If you feel that i have missed any diseases vocabulary then please mention in the comment box. Thanks. This entry was posted in Basic Spanish for Beginners, Vocabulary of Spanish language and tagged A to z medical diseases in Spanish, Ache in Spanish, All diseases in Spanish, Ambulance in Spanish, and Treatments in Spanish, Antacid in Spanish, Anti-itch creme in Spanish, Antihistamine in Spanish, Antiseptic in Spanish, Aspirin in Spanish, Auxilios injection in Spanish, Band-aid in Spanish, Bandage in Spanish, Bee in Spanish, Bite (insect) in Spanish, Bleeding in Spanish, Bloody in Spanish, Broken bone in Spanish, Bruise in Spanish, Burn in Spanish, Chemist in Spanish, Chest cold in Spanish, Conditions, Constipation in Spanish, Cough in Spanish, Cough syrup in Spanish, Cream in Spanish, Cures, Cut (in skin) in Spanish, Dental cavity in Spanish, Dental filling in Spanish, Dentist in Spanish, Diarrhea in Spanish, Dizziness in Spanish, Doctor in Spanish, Drops in Spanish, Earache in Spanish, Emergency room in Spanish, Fatigue in Spanish, Fever in Spanish, First aid in Spanish, Flu in Spanish, Hay fever in Spanish, Head cold in Spanish, Headache in Spanish, Heartburn in Spanish, Hospital in Spanish, How do you say Ache in Spanish, How do you say Ambulance in Spanish, how do you say Antacid in Spanish, How do you say Anti-itch creme in Spanish, How do you say Antihistamine in Spanish, How do you say Antiseptic in Spanish, How do you say Aspirin in Spanish, How do you say Auxilios injection in Spanish, How do you say Band-aid in Spanish, How do you say Bandage in Spanish, how do you say Bee in Spanish, How do you say Bite (insect) in Spanish, How do you say Bleeding in Spanish, How do you say Bloody in Spanish, How do you say Broken bone in Spanish, How do you say Bruise in Spanish, How do you say Burn in Spanish, How do you say Chemist in Spanish, How do you say Chest cold in Spanish, How do you say Constipation in Spanish, How do you say Cough in Spanish, How do you say Cough syrup in Spanish, How do you say Cream in Spanish, How do you say Cut (in skin) in Spanish, How do you say Dental cavity in Spanish, How do you say Dental filling in Spanish, How do you say Dentist in Spanish, How do you say Diarrhea in Spanish, How do you say Dizziness in Spanish, How do you say Doctor in Spanish, How do you say Drops in Spanish, How do you say Earache in Spanish, How do you say Emergency room in Spanish, How do you say Fatigue in Spanish, How do you say Fever in Spanish, How do you say First aid in Spanish, How do you say Flu in Spanish, How do you say Hay fever in Spanish, How do you say Head cold in Spanish, How do you say Headache in Spanish, How do you say Heartburn in Spanish, How do you say Hospital in Spanish, How do you say Infection in Spanish, How do you say Injury in Spanish, How do you say Laxative in Spanish, How do you say Medical centre in Spanish, How do you say Medical Symptoms in Spanish, How do you say Medicine in Spanish, How do you say Motion sickness in Spanish, How do you say Nausea in Spanish, How do you say Nosebleed in Spanish, How do you say Ointment in Spanish, How do you say pain in Spanish, How do you say Plaster cast in Spanish, How do you say Rash in Spanish, How do you say Runny nose in Spanish, How do you say Shot in Spanish, How do you say Sneeze in Spanish, How do you say Sore (adjective) in Spanish, How do you say Sore (noun) in Spanish, How do you say Sore throat in Spanish, How do you say Stomach ache in Spanish, How do you say Swelling in Spanish, How do you say Syrup in Spanish, How do you say Tablet in Spanish, How do you say Throbbing pain in Spanish, How do you say Tonsillectomy in Spanish, How do you say Tonsillitis in Spanish, How do you say Treatment in Spanish, How to Plaster cast in Spanish, How to say Ache in Spanish, How to say Ambulance in Spanish, How to say Antacid in Spanish, How to say Anti-itch creme in Spanish, How to say Antihistamine in Spanish, How to say Antiseptic in Spanish, How to say Aspirin in Spanish, How to say Auxilios injection in Spanish, How to say Band-aid in Spanish, How to say Bandage in Spanish, How to say Bee in Spanish, How to say Bite (insect) in Spanish, How to say Bleeding in Spanish, How to say Bloody in Spanish, How to say Broken bone in Spanish, How to say Bruise in Spanish, How to say Burn in Spanish, How to say Chemist in Spanish, How to say Chest cold in Spanish, How to say Constipation in Spanish, How to say Cough in Spanish, How to say Cough syrup in Spanish, How to say Cream in Spanish, How to say Cut (in skin) in Spanish, How to say Dental cavity in Spanish, How to say Dental filling in Spanish, How to say Dentist in Spanish, How to say Diarrhea in Spanish, How to say Dizziness in Spanish, How to say Doctor in Spanish, How to say Drops in Spanish, How to say Earache in Spanish, How to say Emergency room in Spanish, How to say Fatigue in Spanish, How to say Fever in Spanish, How to say First aid in Spanish, How to say Flu in Spanish, How to say Hay fever in Spanish, How to say Headache in Spanish, How to say Heartburn in Spanish, How to say Injury in Spanish, How to say Laxative in Spanish, How to say Medical centre in Spanish, How to say Medical Symptoms in Spanish, How to say Medicine in Spanish, How to say Motion sickness in Spanish, How to say Nausea in Spanish, How to say Nosebleed in Spanish, How to say Ointment in Spanish, How to say pain in Spanish, How to say Runny nose in Spanish, How to say Shot in Spanish, How to say Sneeze in Spanish, How to say Sore (adjective) in Spanish, How to say Sore throat in Spanish, How to say Stomach ache in Spanish, How to say Swelling in Spanish, How to say Syrup in Spanish, How to say Tablet in Spanish, How to say Throbbing pain in Spanish, How to say Tonsillectomy in Spanish, How to say Tonsillitis in Spanish, Illnesses in Spanish, Infection in Spanish, Injury in Spanish, Laxative in Spanish, List of Cures, List of diseases in Spanish, List of Miscellaneous Terms of medical in Spanish, List of Symptoms and Illnesses in Spanish, List of Treatments in Spanish, Medical centre in Spanish, Medical Symptoms in Spanish, Medicine in Spanish, Miscellaneous Terms of medical in Spanish, Motion sickness in Spanish, Nausea in Spanish, Nosebleed in Spanish, Ointment in Spanish, Pain in Spanish, Plaster cast in Spanish, Rash in Spanish, Remedies, Runny nose in Spanish, Shot in Spanish, Sneeze in Spanish, Sore (adjective) in Spanish, Sore (noun) in Spanish, Sore throat in Spanish, Stomach ache in Spanish, Swelling in Spanish, Symptoms and Illnesses in Spanish, Syrup in Spanish, Tablet in Spanish, Throbbing pain in Spanish, Tonsillectomy in Spanish, Tonsillitis in Spanish, Treatment in Spanish, Treatments in Spanish on January 29, 2017 by satyenhacks. There are many types of dogs found in the world as- Saluki, Basenji, Beagle, Bedlington Terrier and many other some of them we know in English. As we are learning Spanish then we have to all things means all words in Spanish. So we have to know all Dog breeds name in Spanish. 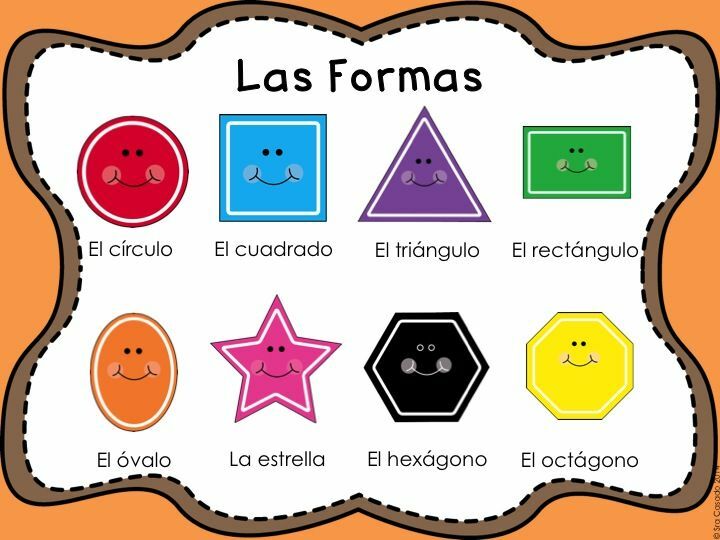 It is very important to know about all words in Spanish so we have provided many Spanish vocabulary related to daily using things as- List of Dogs commands in Spanish, List of flowers in Spanish, List of flowers in Spanish, List of objects in Spanish, List of nationality in Spanish, List of utensils in Spanish and many other vocabulary section. Sp you can learn all vocabulary section by clicking on links. Like many posts related to Spanish vocabulary, today we are discussing about Dogs breeds in Spanish. List are given below so you can learn and know almost all dog breeds in Spanish. Read given list and try to remember it your mind. So this the list of dog breeds of all around the worlds in Spanish. You can found all types of dogs breeds name in Spanish. It is important to know about some of dog breeds name to keep in your mind. If you remember then you can use when you feel to speak. So read and learn. If you feel that any dog breeds name are missed then please mention in given comment box. We will try our best to help you. Thanks. This entry was posted in Basic Spanish for Beginners, Vocabulary of Spanish language and tagged A to z Dog breeds name in Spanish, All dog breeds name in Spanish, All world's Dog breeds name in Spanish. All dog breeds name in Spanish, English to Spanish dog breeds name, List of dog breeds name in Spanish, Vocabulary of all dog breeds name in Spanish on January 29, 2017 by satyenhacks. Dogs are pet animals and we love dogs and keep dogs at our home. Dogs are very faithful animals. If dogs are trained then you can order them to sit or stand and many other activity. As you are learning Spanish then you must know all the commands which we used to give to dogs in Spanish. We have posted many posts about vocabulary section as- List jewelry in Spanish, List of romantic words in Spanish, List of office objects in Spanish, List of animals in Spanish, List of flowers in Spanish and also many other thing. So today we are learning that how to give commands to dogs in Spanish. A list is given below related to Spanish vocabulary. Read and practice daily and also you can give commands to your dog. If you are give daily commands to your dogs then your dog will easily follow your instructions and you will also learn it easily. So read given list which given below. Down! Lie down! Lie there! ¡Échate! ¡Suelo! ¡Tumba! ¡Echa! Come! Here! ¡Ven! ¡Ven aquí/acá! ¡Aquí! Let’s go! – ¡Vamos! ¡Vámonos! Stay! Wait! – ¡Quieto! ¡Quédate! ¡Ahí! Fetch the stick! ¡Ve por el palito! Roll over! ¡Da la vuelta! ¡Voltéate! ¡Gira! Catch the ball! ¡Atrapa la pelota! Chase the ball! ¡Persigue la pelota! Get down off the couch! ¡Bájate del sofá! Don’t jump on the furniture! ¡No te subas a los muebles! Don’t jump up on him! ¡Atrás! Play dead. Hazte muerto. ¡Muerto! Heel! Close! ¡Junto! ¡Al pie! ¡Al lado! Off! Leave it! Drop it! ¡Suelta(lo)! ¡Deja(lo)! Enough! All Done! ¡Ya! ¡Suficiente! Good boy ¡Bien! ¡Muy bien! ¡Buen perro! This entry was posted in Basic Spanish for Beginners, Vocabulary of Spanish language and tagged Attack in Spanish, Be quiet in Spanish, Catch the ball in Spanish, Chase the ball in Spanish, Come here in Spanish, Disappear in Spanish, Don't jump on the furniture! in Spanish, Don't jump up on him in Spanish, Don't move in Spanish, Down in Spanish, Fetch the stick in Spanish, Get down off the couch in Spanish, Get it in Spanish, Go away in Spanish, Heel in Spanish, How do you Go away in Spanish, How do you say Attack in Spanish, How do you say Be quiet in Spanish, How do you say Catch the ball in Spanish, how do you say Chase the ball in Spanish, How do you say Come here in Spanish, How do you say Disappear in Spanish, How do you say Don't jump on the furniture! in Spanish, How do you say Don't jump up on him in Spanish, How do you say Don't move in Spanish, how do you say Down in Spanish, How do you say Fetch the stick in Spanish, How do you say Get down off the couch in Spanish, How do you say Get it in Spanish, How do you say Heel in Spanish, How do you say Jump in Spanish, How do you say Let's go in Spanish, How do you say Lie down in Spanish, How do you say Off! Leave it! Drop it in Spanish, How do you say Run in Spanish, How do you say Silence in Spanish, How do you say Sit in Spanish, How do you say Stay in Spanish, How do you say Well done in Spanish, How do you tell to your dogs Shake in Spanish, how do you tell your dogs lie down in Spanish, How do you tell your dogs Roll over in Spanish, How tell your dog Well done in Spanish, How to command dog in Spanish, How to command my dog in Spanish, How to command your dog in Spanish, How to commands my dog Don't jump up on him in Spanish, How to commands my dog Off! Leave it! Drop it in Spanish, How to commands my dog Run in Spanish, How to commands my dog to Attack in Spanish, How to commands my dog to Be quiet in Spanish, how to commands my dog to Catch the ball in Spanish, How to commands my dog to Chase the ball in Spanish, How to commands my dog to Come here in Spanish, How to commands my dog to Don't jump on the furniture! in Spanish, How to commands my dog to Don't move in Spanish, How to commands my dog to Fetch the stick in Spanish, How to commands my dog to Get down off the couch in Spanish, How to commands my dog to Get it in Spanish, How to commands my dog to Silence in Spanish, How to commands my dog to Stay in Spanish, How to commands my dogs Disappear in Spanish, How to commands my dogs Down in Spanish, How to commands my dogs in Spanish, How to commands my dogs to Go away in Spanish, How to commands my dogs to Heel in Spanish, How to commands my dogs to Let's go in Spanish, How to commands my dogs to Silence in Spanish, How to commands to your dogto Be quiet in Spanish, How to commands your Chase the ball in Spanish, How to commands your dog Down in Spanish, How to commands your dog to Attack in Spanish, How to commands your dog to Catch the ball in Spanish, How to commands your dog to Don't jump on the furniture! in Spanish, How to commands your dog to Don't jump up on him in Spanish, How to commands your dog to Get down off the couch in Spanish, How to commands your dog to Get it in Spanish, How to commands your dog to Heel in Spanish, How to commands your dog to Not in Spanish, How to commands your dog to Off! Leave it! Drop it in Spanish, How to commands your dog to Silence in Spanish, How to commands your dog to Stay in Spanish, How to commands your dogs Jump in Spanish, How to commands your dogs to Come here in Spanish, How to commands your dogs to Don't move in Spanish, How to commands your dogs to Fetch the stick in Spanish, How to commands your dogs to Go away in Spanish, How to commands your dogs to Let's go in Spanish, How to commands your dogs to lie down in Spanish, How to commands your dogs to Roll over in Spanish, How to commands your dogs to Shake in Spanish, How to commands your dogs to sit in Spanish, how to commands your Run in Spanish, How to commands your to Disappear in Spanish, How to say Attack in Spanish, How to say Be quiet in Spanish, How to say Catch the ball in Spanish, How to say Chase the ball in Spanish, how to say Come here in Spanish, How to say Disappear in Spanish, How to say Don't jump on the furniture! in Spanish, How to say Don't jump up on him in Spanish, How to say Don't move in Spanish, How to say Down in Spanish, How to say Fetch the stick in Spanish, How to say Get down off the couch in Spanish, How to say Get it in Spanish, How to say Go away in Spanish, How to say Heel in Spanish, How to say Jump in Spanish, How to say Let's go in Spanish, How to say Lie down in Spanish, How to say Off! Leave it! Drop it in Spanish, How to say Run in Spanish, How to say Silence in Spanish, How to say Sit in Spanish, How to say Stay in Spanish, How to say Well done in Spanish, How to tell dogs to Down in Spanish, How to tell my dogs Well done in Spanish, How to tell your dog Don't move in Spanish, How to tell your dogs Roll over in Spanish, How to tell your dogs Shake in Spanish, How to tell your dogs to sit in Spanish, Jump in Spanish, Let's go in Spanish, Lie down in Spanish, List of dog commands in Spanish, Not in Spanish, Off! Leave it! Drop it in Spanish, Roll over in Spanish, Run in Spanish, Shake in Spanish, Silence in Spanish, Sit in Spanish, Stay in Spanish, Well done in Spanish on January 29, 2017 by satyenhacks.